PFN cautions Nnamdi Kanu on uncivil activities – Royal Times of Nigeria. The Pentecostal Fellowship of Nigeria (PFN) has advised Nnamdi Kanu and IPOB to use dialogue rather than engaging in uncivil activities in their struggle for Biafra, Vanguard reports. The Chairman of PFN, Enugu State Chapter, Rev. Godwin Madu, gave this advice shortly after a special prayer meeting for peace in the country on Wednesday. The special meeting was organised by the PFN at the Redeemed Christian Church of God (Province of Excellence), Enugu. 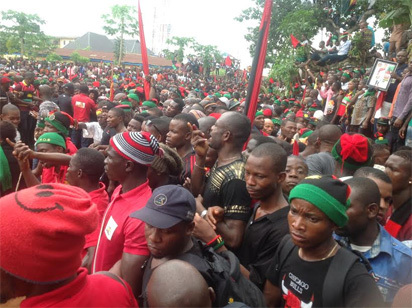 According to him, PFN is opposed to the radical approach being used by the Indigenous People of Biafra (IPOB) in its agitations for the South-East. He said; “Nigeria is good as a country. Anywhere we feel aggrieved, the matter could be addressed amicably instead of heating up the polity and creating unnecessary tension in the entire country,’’. The PFN Chairman also urged the Arewa youth to quickly sheath their swords and work for peace since violence and crisis cannot benefit anybody. He told the northern youth that Nigeria had no particular landlord, hence no tribe was empowered by the Nigerian Constitution to issue quit notice to any other ethnic group or people.